I’ve never been much of an outdoor adventurer, so locating native orchids in the wilds of Minnesota has always had more appeal in the abstract than in reality. However, a photo class at the end of June made it easy to find and photograph pink lady’s slipper orchids (Cypripedium acaule Ait.) in Cascade River State Park. I think I need to get out next spring and try to find more native orchids. After all I’ve got 49 varieties to search for right here in Minnesota! This week I’m linking to Floral Friday Fotos featuring floral-themed posts from around the world. Lovely shots of these unusual orchids. 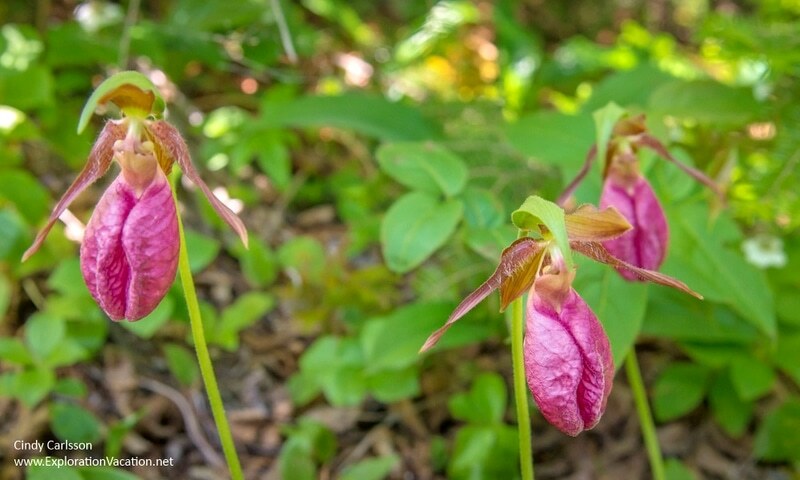 Their colour is pretty too – many lady’s slipper orchids are rather dull in browns and duns. Thank you. We are lucky to have several very lovely and colorful native orchids in Minnesota. They are just hard to find!